While presenting a workshop last week in Northern New Jersey hosted by Grubb & Ellis, Inc., a property management firm, I engaged in a conversation with an architect about a learning experience he encountered while installing a vegetative or live Roof. Vegetative roofs have been utilized in Europe for about 25 years and are gaining popularity in the United States especially for commercial buildings. From a building science perspective the thing I like about live roofs is the natural property of plants when it comes to resisting solar heat gain from infrared radiation. The albedo, which is the surface reflectivity of the sun’s radiation, plays a large part in the benefit of a live roof. On the hottest day in the summer, the average surface temperature of living plants in direct sunlight is only two degrees greater than the temperature of the ambient air. If you measured the temperature of a dark surface it could be as much 20 to 30 degrees higher than the ambient air. Since plants never get more than two degrees hotter than the ambient air it makes them the obvious cool roof. While we are seeing an increase in cool roofs in building design, we can’t lose sight of common sense. Now back to the architect and his tale. This architect explained that the construction on the project was delayed which meant that the vegetative roof was installed in the summer. By the time the plants arrived to be installed on the roof structure it was July, the hottest and driest time of year in northern New Jersey. As a result, the first three months of the roofs’ life required watering. The architect never imagined that he would have to water his roof for three months. 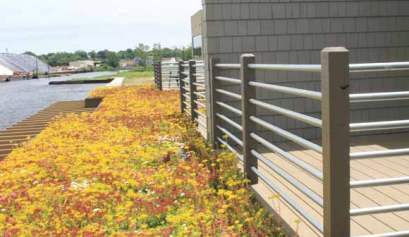 The designers and contractors never considered in the scheduling that the vegetative roof would need support if installed at the hottest and driest time of year. The installation of the living component could have been delayed to more appropriately suit the environmental conditions but the benefit to the building of the vegetative albedo would not have been realized when it was actually needed the most- in the mid and late summer. It’s a great example of one of the many trade-offs we have to evaluate when building sustainably.